EasyCare announced today the release of the first white paper on the results of the thermographic imaging study of horses’ hooves before and after exercise. 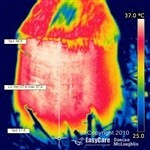 Led by Duncan McLaughlin, the study used infrared thermography to investigate changes in temperature and heat patterns with various types of hoof protection at equine endurance events in the US and Australia. 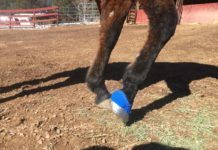 “Infrared thermography is a tool that provides objective data about circulation and inflammation in the hoof by measuring heat and examining actual temperature increases and changing heat patterns of the hoof capsule,” said Duncan. The white paper achieves just that. 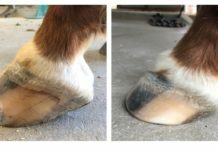 One segment of the horses in the study had an average dorsal hoof-wall temperature increase of 8.9°C /16.1°F when comparing their pre-ride and post-ride temperatures. By comparison, another segment showed an average dorsal hoof-wall temperature increase of 2.9°C/5.2°F. The study also compares and contrasts differences in hoof-wall temperature of horses using black hoof boots and those equipped with steel shoes. Those interested in reading the white paper can download the barefoot hoof thermography study in pdf format. The white paper includes summary charts of the data collected, color images from the test horses and a short summary analysis of the results. 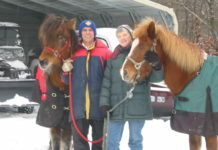 Duncan McLaughlin is a professional hoof care practitioner and horse massage therapist (certified IV Equine Myofunctional Therapy). He has trained and competed in a range of horse activities but predominately dressage and endurance riding, including Tevis, Shahzada and Quilty.